The Minnesota Public Utilities Commission (PUC) has just announced public hearings on whether there is a NEED for the first of the proposed oil pipelines, called Sandpiper (black line in map). Members of the public can ask questions and comment at hearings scheduled for the week Jan 5-9, to be held in St Paul, Duluth, Bemidji, Crookston, and St. Cloud. The PUC has the final say on this matter. Comments can also be made on-line from December 8th through January 23rd here: https://minnesotapuc.granicusideas.com/discussions/north-dakota-pipeline-company-llc-application-for-a-certificate-of-need-for-the-sandpiper-pipeline-project-in-minnesota-cn-13-473 or (if unobtainable) go to https://minnesotapuc.granicusideas.com/discussions and scroll way down to “North Dakota Pipeline Co”. Friends of the Headwaters (FOH) is now represented by the legal team at the Minnesota Center for Environmental Advocacy (MCEA). 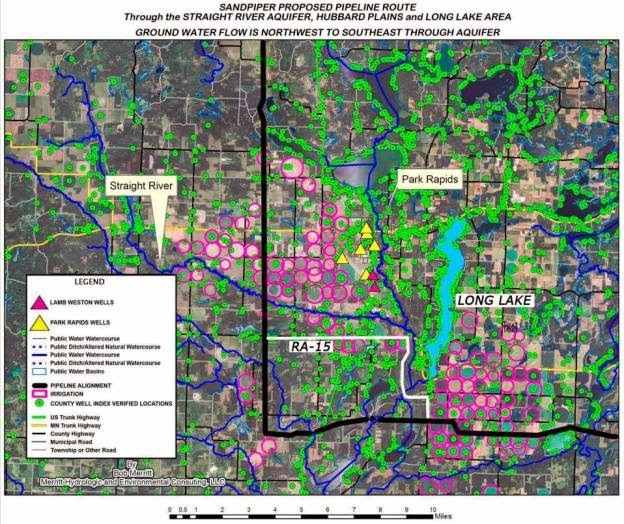 The Hubbard County Coalition of Lake Associations agrees with FOH on the importance of relocating the Sandpiper Pipeline Route away from our lake country's natural resources.